One of the benefits of Facebook, apart from enabling me to keep in touch with all my fabulous raw friends scattered around the country, (and all over the world if I’m honest), is that you get to hear of lots of exciting things happening in the raw world, hot of the press...or cool from the dehydrator so to speak! One of my Facebook friends, Anabrese – the talented lady behind www.rawlifestyle.co.uk has just started doing a Potluck Postie! What a fabulous idea! Basically, if you hop over to her site, and place an order by Tuesday, on Thursday, Anabrese posts out samples of whatever delights she’s been making that week! Hence the ‘Potluck’. Chocolate Flax Crisp: A raw chocolate coated flax cracker, bursting with superfoods. Chocolate Cereal Bars: Packed with nuts, seeds and lots of yummy superfoods...I can feel myself buzzing! So exciting to have raw food delivered! Ooh she also does Christmas Hampers too! 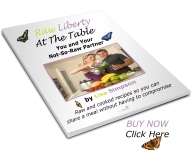 http://rawchristmasandthanksgivingrecipes.blogspot.com/ What a fab way to take the stress of wondering what to eat for your raw Christmas when everyone around you is eating cooked food! Treat yourself!!! ...so what do us girls reach for at times like these? What else? Nothing else hits the spot in quite the same way does it? But not Cadbury’s for me? Nooooooooooo! I’m working really hard on self love, looking after my body and spirit, and tucking into sugar and dairy loaded refined **** doesn’t exactly fit the bill! I've always believed that you eat **** you feel **** so then you eat more ****! It's a vicious circle, that I definitely intend not to get caught up in. What I needed is something to treat myself to that was not only totally, indulgently delicious but also something that would be good for me and love me back. This is where I get REAL...REAL Raw Energy And Living Food! I got wind of the fact that my lovely friend Francine, the beautiful, talented lady behind REAL, makes the most amazing raw chocolates! She kept that secret talent well hidden!!! Francine is without a shadow of a doubt, a raw goddess, and puts her love and passion for healthy, yummy raw food into the amazing chocolates she makes. Just a side note to those who think it takes strong will power to stay raw, and that we are depriving ourselves of indulgent treats….NO WAY! With such amazing chocolates as these, raw living is amazing! Might as well face it I'm addicted to kale! Might as well face it I’m addicted to Kale! So, yeah, I’m prepared to admit it...I’m addicted to kale – I just can’t get enough of it. But is that a bad thing? There’s far worse that I could be addicted to for sure. Time to face it, and look at some of the facts behind my addiction. Could Kale be a superfood after all? I have noticed that the word “superfood” is being used more far more liberally these days, particularly as a marketing ploy to get people to buy new products in their quest for health, but in my humble opinion kale is truly deserving of the title. For a start, it is packed with beta-carotene, folate and Vitamin C. It is also one of the richest vegetable sources of calcium (great info. for me to tell those who still think I should be getting my calcium from dairy products) plus it contains vital minerals such as iron, magnesium and potassium. It is also rich in sulphur phytochemicals which are believed to help protect against certain types of cancer and also the phytochemicals, lutein and zeaxanthin, (don’t ask me to pronounce that!) which are believed to help reduce the risk of cataracts and age related macular degeneration - one of the main causes of loss of vision in the UK. v 17 times more Vitamin C than carrots and four times more than spinach –wow! So looks like my addiction is a healthy one! Phew! Kale on its own can be a little tough, particularly for those new to raw, but it is possible to wilt it, breaking down the cell walls, so it takes on a more ‘cooked’ appearance, by firmly but lovingly massaging it with oil and a touch of salt. Chop kale, removing the woody stalks if preferred, (I quite like them but think I may be on my own on that one! ), and place in a large bowl. Drizzle with cold pressed olive oil and sprinkle with salt, and massage firmly into the kale until it wilts and reduces in volume by about a third. Then it’s over to you...add whatever takes your fancy! I like to take a large avocado, cut it in half. Massage half into the kale and dice the other half and stir into the kale. Add chopped cherry tomatoes, chopped sundried tomatoes, chopped spring onions, olives and mix. Drizzle with lemon juice and sprinkle with hemp seeds. Volia! Perfect wholesome and hearty meal. No measuring required, just how I like it, all thrown into a bowl, tossed and ready to go! If you make more than you can eat, and don’t want it the next day, you can always pop it in the dehydrator for a few hours and you have delicious kale crisps! That brings me on nicely to the heart of my addiction...kale crisps! There are so many recipes for kale crisps, and all are equally delicious! I’ll share a few of my favourite recipes with you here. Unfortunately I just tend to throw ingredients into the blender without measuring, so I’ll leave you to taste test and decide what suits you. Simply Kale: Massage kale with oil, lemon juice and salt. Dehydrate til crisp. Spicy Kale: Blend red pepper, soaked cashew nuts, cumin, ground coriander, cayenne. Massage blended mix into kale. Spread on dehydrator sheet and dehydrate til crisp. Cheezy Kale: Blend yellow pepper, soaked cashew nuts, basil, nutritional yeast, salt. Massage blended mix into kale. Spread on dehydrator sheet and dehydrate til crisp. I should point out that making kale crisps should come with a warning....they are addictive! I have been known to raid the dehydrator before they are even crisp! So if you feel that you may be similarly tempted, I would suggest you make the Kale chips and put them in the D overnight! The smell you’ll wake up to in the morning will be mouthwatering! Spicy kale 'before' dehydrating. Unfortunately I ate this batch before it was fully crisp, so have no 'after' pic for you, sorry! If you do not have a dehydrator, all is not lost. I have just sample some amazing kale crisps sold by http://www.fresh-network.com/ and http://www.detoxyourworld.com/acatalog/index.html . This new line of kale chips from London’s InSpiral Lounge. Their Kale chips are supremely crunchy, made with a cashew coating containing Himalayan crystal salt and various natural flavours, which are gently dehydrated. They come in three amazing flavours, Wasabi Wheatgrass, Cheesie Purple Corn (my personal favourite) and Baobab Cyder Vinegar. Over the last couple of months, I’ve finally got round to doing something that’s been on my mind for simply ages...ordering an organic fruit and vegetable delivery! Now I’m wondering why it took me soooo long...Slow or what? The company I order from is Riverford Organic, www.riverford.co.uk The Riverford box scheme began when Guy Watson started delivering vegetables locally to 30 friends in Devon. They now deliver around 47,000 boxes a week to homes around the UK from their regional sister farms, one of which is just 20 minutes from me! Although not all the produce is locally grown, it all comes from organic farms, and is always beautifully fresh and bursting with flavour! Each fortnight, I’ve been excited to discover what’s in my box, and what tantalising tastetastic recipes I can create from the contents...it’s a bit like’ Ready Steady Cook’, only without the ‘cook’ bit of course ;) This week’s box contained the beautiful and yet unusual looking Romanesco Cauliflower, which has inspired this series of blogs: ‘What’s in the Box?’ - a fortnightly look at my organic box, and what delectable recipes I create from its seasonal contents. This kinda challenge is fun for me, being a throw-it-together-and-see chef when preparing food for myself ( I’m sadly still the only one eating raw in my home; I do go to greater lengths with my recipes when preparing raw recipes for other people, I hasten to add! ;) ); but I hope my ideas will also serve to inspire you to be creative with your seasonal fruit and vegetables. So...What’s in the Box this week? This week’s recipes are already exciting me! This was my choice of breakfast from the incredibly extensive buffet at the hotel my family stayed at in Lanzerote this summer. Yes...I was amazed to find bee pollen there – located right next to the peanut butter and nutella of all places!!! Peel and thickly slice the oranges. Sprinkle with lots of bee pollen. And that’s it! Doesn’t come any more simple than that! If you can resist the temptation to eat it straight away, leave for half an hour, the juice from the oranges combines with the bee pollen to produce a delicious sauce, mmmmmmm! Blend: 1 banana, 2 oranges, 2 handfuls of spinach – or more if you’re a green queen like me ;) and a handful of soaked goji berries....and Volia! Simple, delicious and super nutritious breakfast, or whenever! Basically it's broccoli, tahini and lemon, with some other 'magical' ingredients...I topped mine with a sprinkle of Crystal Manna, just ‘cos I love to sparkle!, and served it with cucumber and yellow pepper! Amazingly tastastically bonkers!!! And seriously filling! I may well use the leftovers in nori rolls for lunch tomorrow! The Romanesco is a relative of the common cauliflower, and is so strikingly beautiful; a brilliant light green colour, displaying a perfectly natural pattern of spiraling points. The beauty and geometry of this plant is reason enough to display it as part of a centrepiece. It’s flavour is slightly milder than that of traditional cauliflower and it is totally delicious raw. Prepare all of your salad vegetables as above and toss in a large bowl. For the pesto, place the garlic cloves in a food processor and chop finely. Add the lemon zest and juice, basil and nuts and process again until all of the nuts have been finely chopped and the ingredients are well combined. Pour the pesto over the veggies and toss well to coat.